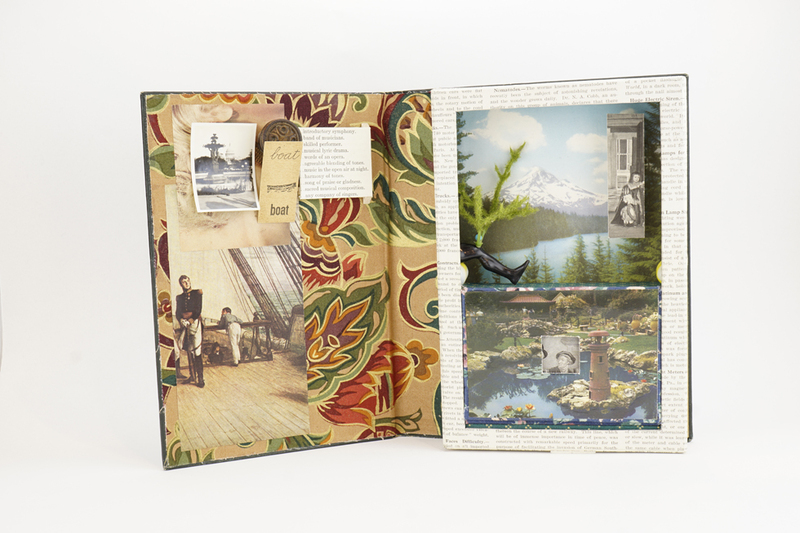 The inside cover is covered with an abstract floral design fabric composed of dark reds, greens and earth tones. 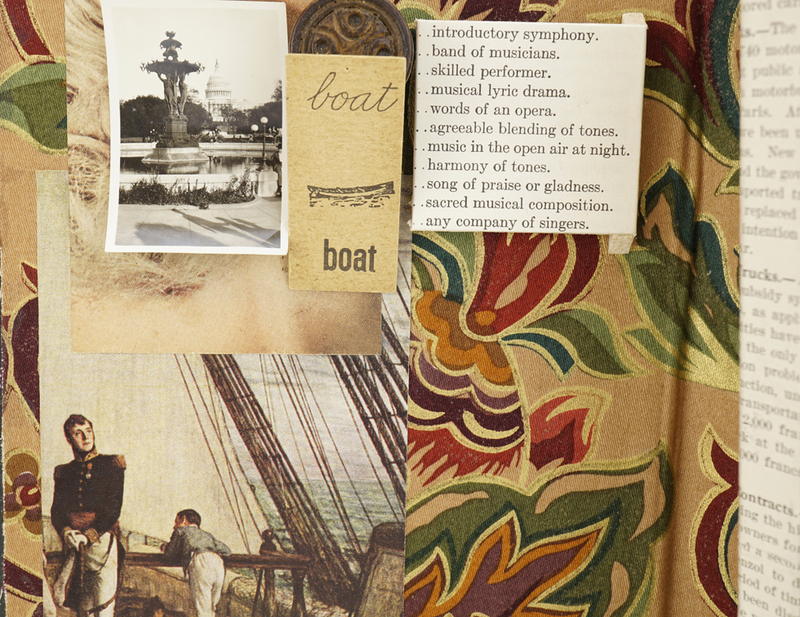 Pasted onto of this fabric, on the left side, is a sea captain standing on deck, cropped from the painting “Napoleon on the Bellerophon” by William Orchardson. Above this is a color photo of a blonde woman’s head, cropped so that you can only see part of her neck and hair coming down the side. Attached to this photo is a small black-and-white photograph of a fountain with the U.S. Capitol Building in the background. 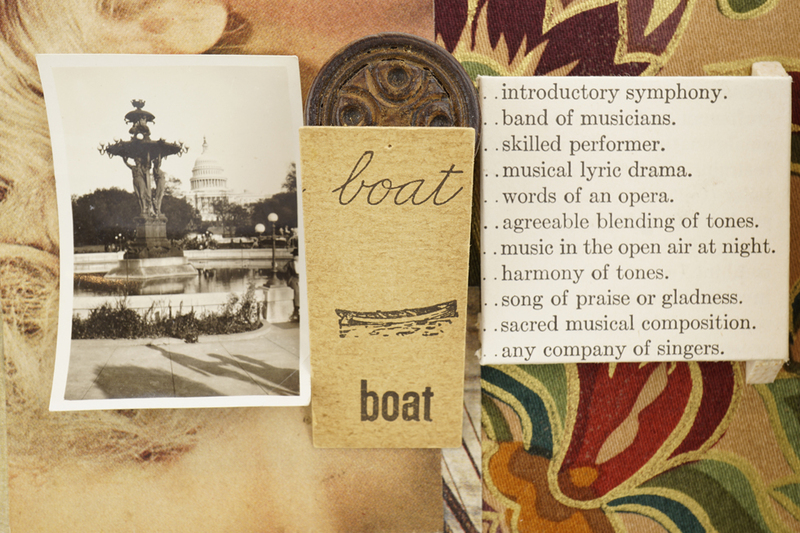 Beside the photo is an ornate wooden knob and a game tile with a drawing of a canoe and the word “boat” printed above and below the image. To the right of all this is a list of phrases pertaining to music. 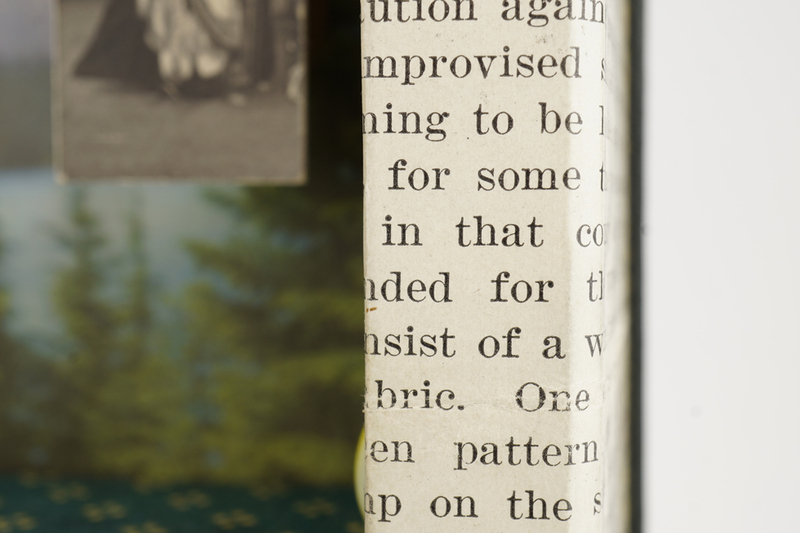 The frame is covered with pages from the encyclopedia set from which this book originally came. 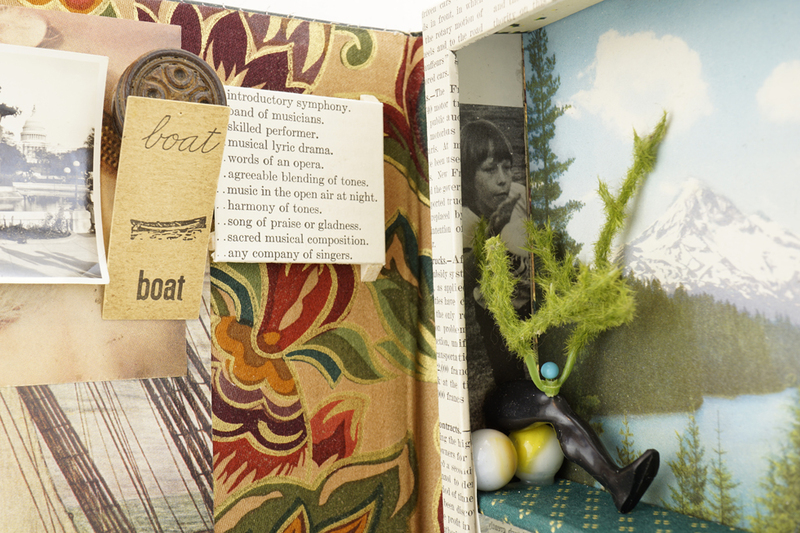 The title of this piece, “Nematodes”, is a section heading on these pages. Inside the top section of the frame is color photo of Mt. Washington, in Oregon. 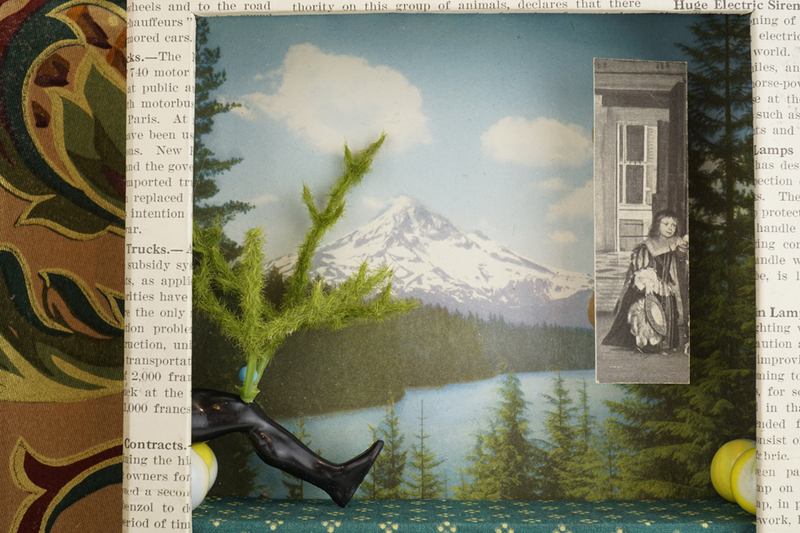 In the left bottom corner are two white marbles with a muscular, black, toy leg with an artificial green furry branch pinned to the knee by a light blue map pin. 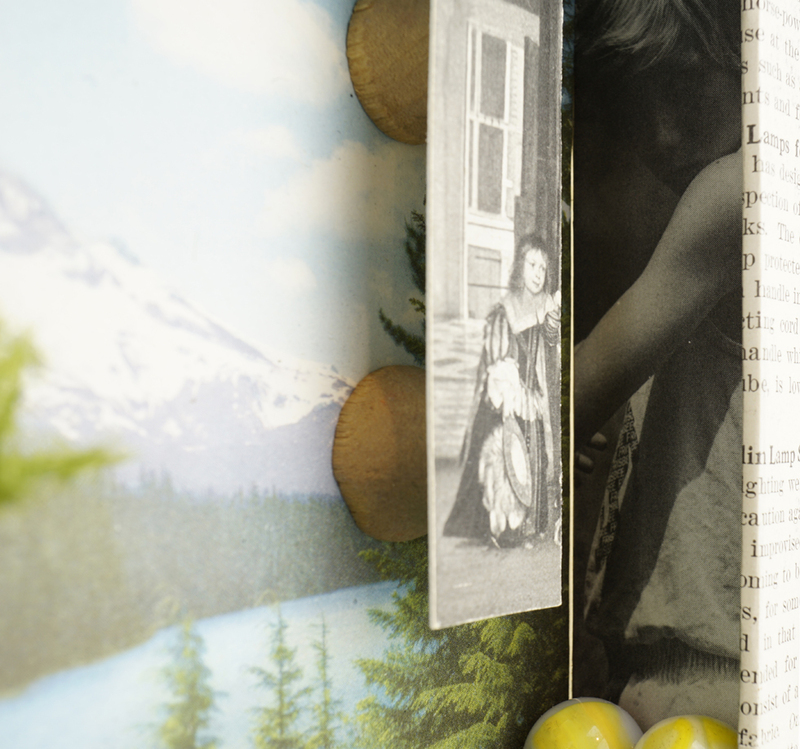 There are also two mostly yellow marbles in the opposite corner — they are all resting on a piece of green fabric with a yellow diamond pattern. On the left and right side panels are black-and-white photos of a teenage boy throwing a frisbee. Floating over the Mt. Washington picture on the right is a long rectangular cropped image from an old masters painting of a girl in royal dress. On the top panel of this section is an underwater photo of a fish with a small pale octopus. 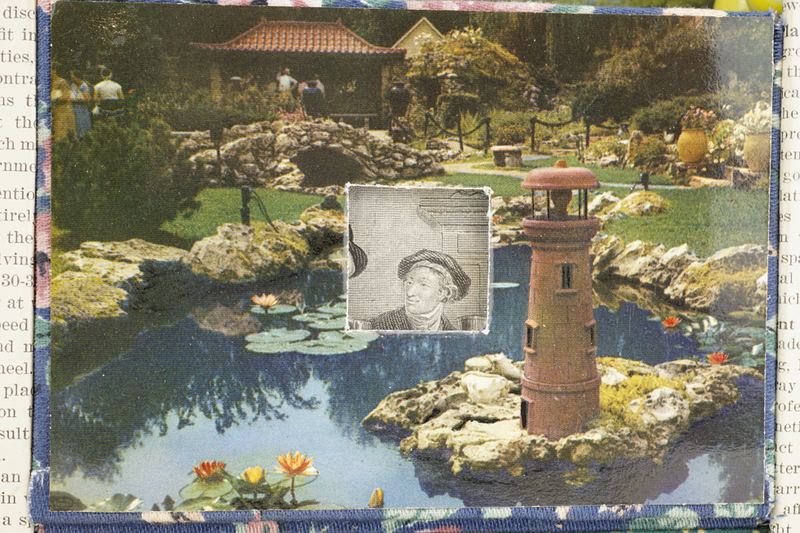 The bottom section is covered with a color postcard of a landscaped Florida park with an inch-square window cut in the middle, revealing part of an etching illustration. This postcard is a flap that opens downward revealing the interior of this bottom section. In the center we is the full illustration of what was partially revealed through the small square window. 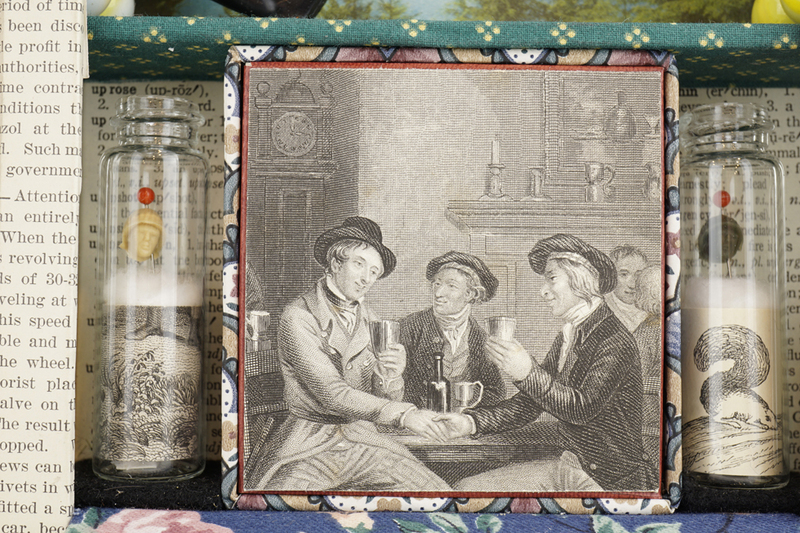 It is an illustration of three 18th-century men drinking, with the two men in the foreground shaking hands. This illustration is on a tile which itself can be removed, revealing another interior. 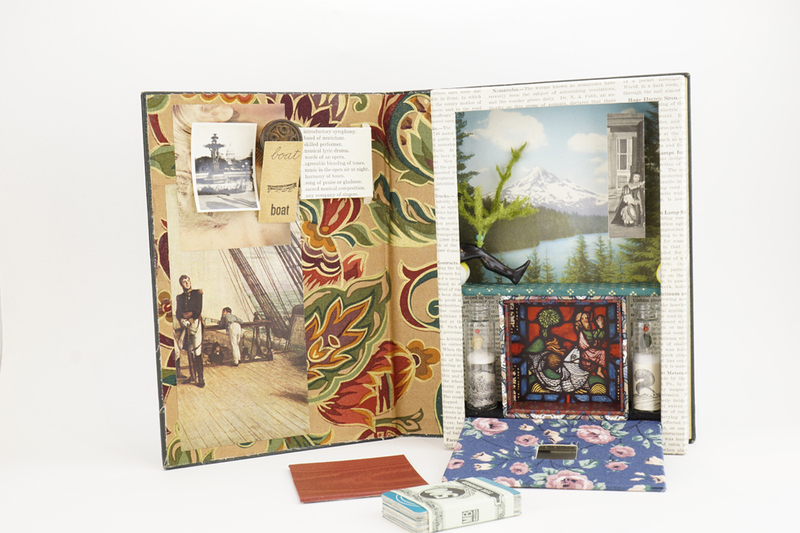 This interior box contains a set of collaged cards wrapped with a toy $500 bill. 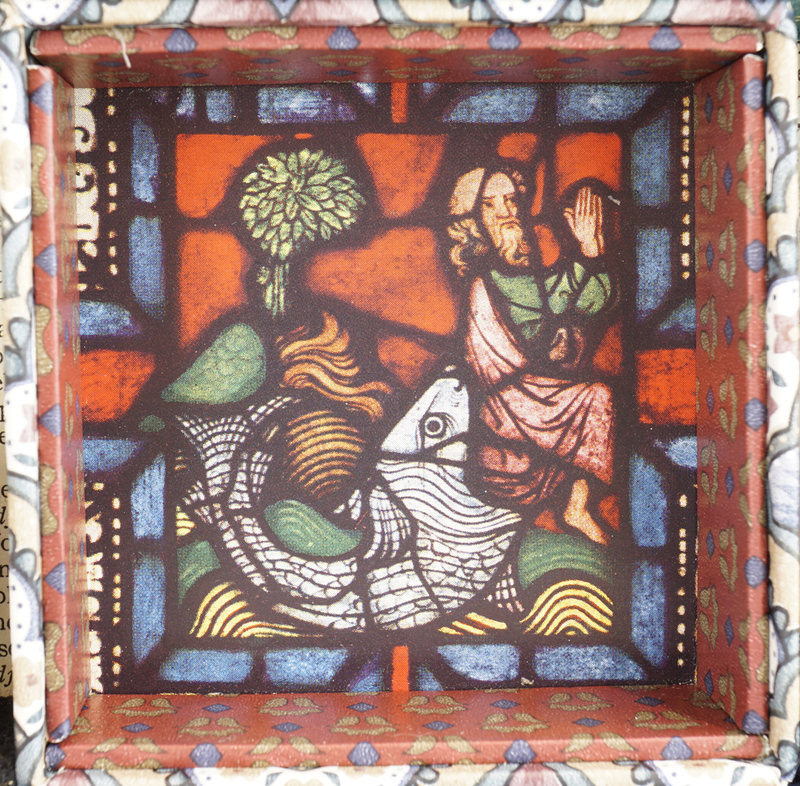 In the background of this central box is a color reproduction of a stained-glass image. It is of a biblical figure, presumably Jonah, being devoured by a fish. To the left and right of this box are two small vials. Inside the bottom third of each vial are etching illustrations of woodland scenes. 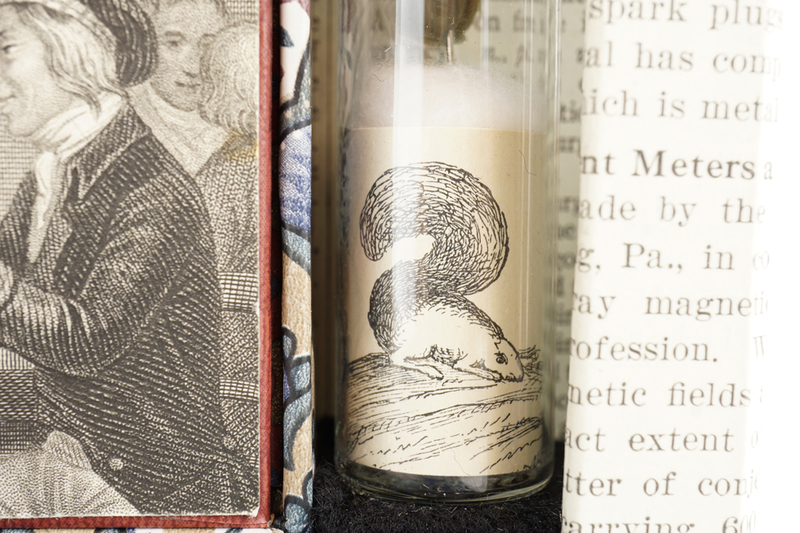 On the right is a squirrel and in the left vial is a ground scene of a bush and the foot of someone standing nearby. 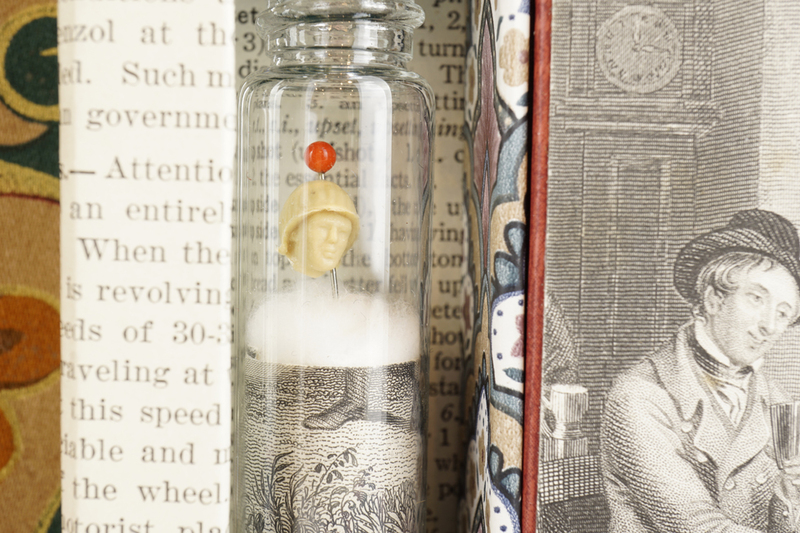 Atop these illustrations and inside the vials, pinned to a bed of cotton, are disembodied toy plastic heads. In the background of the compartment where the vials are placed are dictionary clippings from the “U” section. Mirrors are on either side of this lower compartment.